I am really honored and thrilled that I'm featured this week on the Love to Sew Podcast. It was a really interesting conversation. Especially since it's hit me this year that I've been sewing almost 50 years. I think I even said several times during the conversation, I'm old! But it's not in a negative "ohmygodI'msoold" way but more in a celebration of the fact that I've lived this long. That I'm in relatively good health and will probably live a couple more decades sewing until the very end. Anyway, if you get a chance, check out the podcast here. If you haven't listened to any of the other podcasts (really why not?) check out some of the other interviews and discussions. Caroline (proprieter of Blackbird Fabrics) and Helen (designer of Helen's Closet Patterns) have a variety of sewing discussions, as well as, interviews with sewing entrepreneurs and sewing bloggers. Check them out because I'm sure there is someone or something you want to know more about. Okay back to normal sewing journeys and conversations! I am very excited about this! I've wanted to hear you on their show - congrats! You reference Leona as your inspiration for your blog. What is the name of her blog? I look forward to hearing this and putting a voice to your blog thoughts. I've been listening to lots of podcasts lately and find them a great "filler" while cleaning and sewing. They are a great addition to sewing social media, albeit some far better than others, like anything else. Naptime Seamstress - their theme music is cool isn't it! And thank you for listening! I loved hearing your voice! It was great learning more about you and your sewing. Absolutely loved it. Thank you! I'm not much of a podcast person - listened to my first ever a few weeks ago! But I will be sure to take a listen tonight - yesterday got away from me. And 50 years of sewing is AMAZING!! I'm not much of a podcast person either because I have to sit and listen to them. They can't play like background music like the TV does. But I do listen to this one when Sewists I like are on it. I like hearing their stories. Thanks for listening to it. I appreciate it. Many have a niche appeal and I've found it worth my time to listen to a lot of different ones to find those that I enjoy the most. Hey, Carolyn, I'm even older than you. I can relate to everything you said. I completely understand the love affair with Viyella. I started hand sewing when I was very little, making doll clothes, and later moved to using a machine. I totally agree with you that sewing is a creative endeavor, and can be a true art form, and that your fabric collection is your artistic medium. Thanks for spreading your enthusiasm for sewing to the next generation. It was fun to finally hear your voice. Hope to meet you some day. Karel - thank you so much! I wasn't sure if anyone would get the Viyella reference. I'm glad you enjoyed the podcast and I'm thrilled that you're still reading my sewing ramblings & journeys! Fun, Carolyn! Looking forward to listening to this tonight! I've been reading your blog for a while and loved hearing you on the podcast! You have such a great outlook and refreshing honesty. Hope to hear you on a show again! Meant to use your podcase for bedtime listening last night, but sleepytime got to me. So I was able to listen in late this afternoon at work. It was great getting to know more about your,your sewing process and your history as a sewist especially since your's was the first blog I ever read back in 2006. Found you when I stumbled onto Artisian's Square or Stitcher's Guild. I grabbed your link, and have been reading here ever since. I don't think I had ever heard your voice before today. It's so funny that your voice sounded exactly the way I thought it would. You know yours was the reason I wanted to start a blog too. Thanks for the blogging inspiration and for the fabric you've shared with me from your amazing collection! Faye - I'm so thrilled that you've continued to follow along especially after you started your own blog. I was also happy to share fabric from the collection with you. Hopefully we will both be blogging for years to come. Thanks for enjoying the podcast! Carolyn, I just listened to your podcast and loved every minute of it. You were downright delightful. It was great to hear your voice, your positivity and your passion for this art form. Thank you. Bunny thank you so much for listening to and enjoying the podcast. That means so much to me! 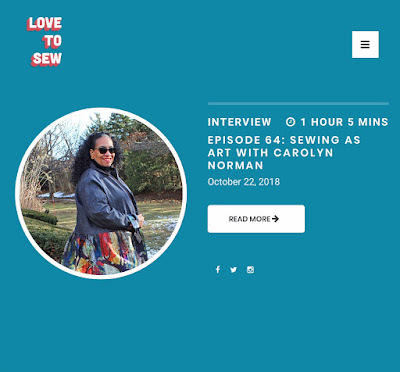 I have never wanted to read a sewing blog before i heard you speak on Love to Sew podcast. We are the same age and also learned to sew making Barbie clothes! Thanks for the encouragement. Oh my goodness, I've been a long-time fan of your blog, and I absolutely loved you on the podcast!!!! Congratulations! I will definitely be listening in! Love to Sew is one of my favorite podcasts to listen to, especially while traveling or in carpool. I have been reading your blog for a few years and I just listened to you on the podcast today and it was like I already knew just how you would sound from the blog! Your enthusiastic approach to sewing and sharing your knowledge and your love of fabric all shone through just as it does on your blog. Thank you so much for continuing to do what must be a lot of work for your blog on top of a full time job, when you could be sewing instead! Great podcast. Loved hearing the voice of my favorite blogger. I loved this podcast. I have been sewing about the same time as you and also started with barbie clothes. I did not go into fashion as my career. It is my hobby. I enjoy your blog and am new to reading blogs, podcasts and you tube videos. I still have fitting issues, even after all these years. I guess I still haven't figured it out especially in woven shirts. Listened to it today and love being able to hear your voice. You are amazing and encourage me to follow my own fashion inspirations! I love your thought process. I listened to your podcast yesterday and thoroughly enjoyed it! Though I'm a bit older, I could relate to so many things you mentioned, I especially enjoyed your comments about changes in fashion over the years. I, too, remember when we could first wear pants/slacks at work ;-) It was nice to hear your voice. Keep on, keeping on! Just like that it's the end of the month! Lavender for Winter - Why Not?